The Outlook client must be configured to access a user’s GroupWise account. The following instructions assume that the Outlook client is already installed on the desired machine. 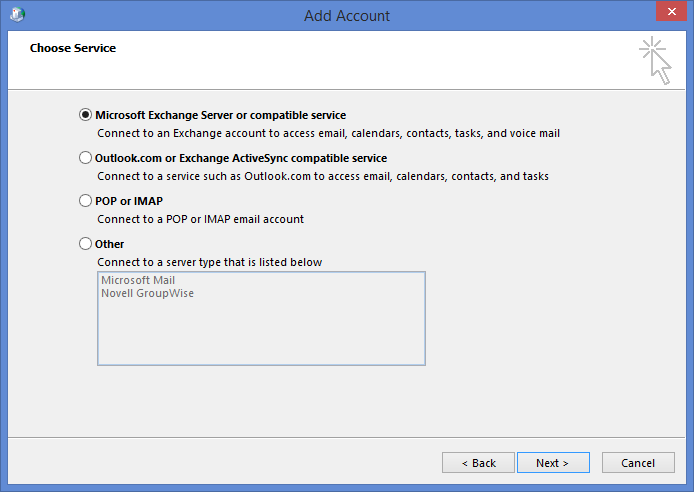 There are two ways to add a GroupWise account to the Microsoft Outlook Client: manually or using the GroupWise profile setup tool. Before using the GroupWise Profile Setup utility, you can configure it so less information needs to be entered by the end users. The GroupWise Profile Setup utility is found in /opt/novell/datasync/tools/GWProfileSetup.zip. Configuring the GroupWise Profile Setup utility allows you as an administrator to customize the utility and fill out global information for your users. You can also use it to import certificates for Free/Busy, GMS, and an LDAP address book if you do not use commercial certificates or your CA certificate is not found in the Windows Certificate Authority Store. You can follow the steps found in Gathering CA Certificates in the GroupWise Mobility Service 2014 R2 Security Enhancements Quick Start if you need help gathering the certificates. If you do not want to customize the utility, skip to Using the GroupWise Profile Setup Utility. Download the GWProfileSetup.zip from the GMS server and extract the files to a temporary location on your workstation. Edit GWProfileSetup.ini using the information in the file to modify the variables. Zip up the 64bithelper.exe, GWProfileSetup.exe, GWProfilSetup.ini, and any CA certificates needed and deliver the zip file to your users so they can create the GroupWise Profile for Outlook on their Windows machines following the steps in Using the GroupWise Profile Setup Utility. The steps below allow your users to create the GroupWise Profile for Outlook on their Windows workstation. The same steps must be followed whether or not you configured the utility. Extract the GWProfileSetup.zip to a temporary location on your workstation. (Conditional) Accept any certificates that needed to be added to your machine. 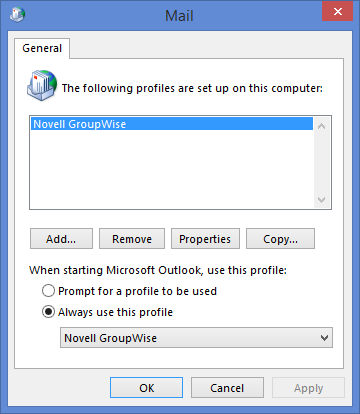 Enter in the information required to create the GroupWise Profile for Outlook. 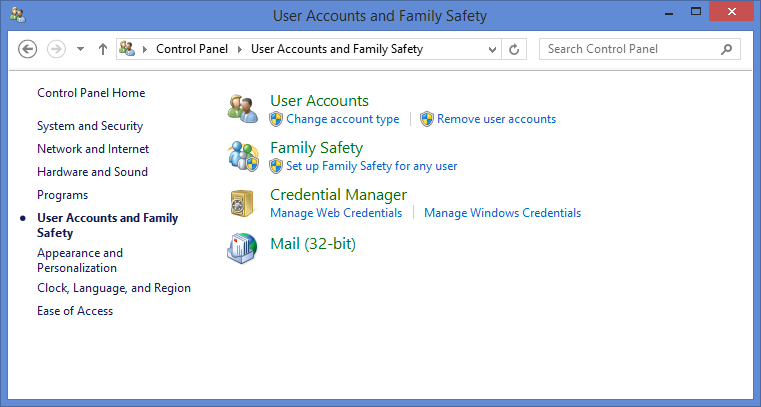 On the machine, open Control Panel > User Accounts and Family Safety. (Conditional) If a Mail Setup dialog box is displayed, click Show Profiles to display the Mail dialog box. If GroupWise is installed on the machine, the Profiles list includes a GroupWise profile, as shown in the screenshot above. You need to keep this profile and create a new profile. 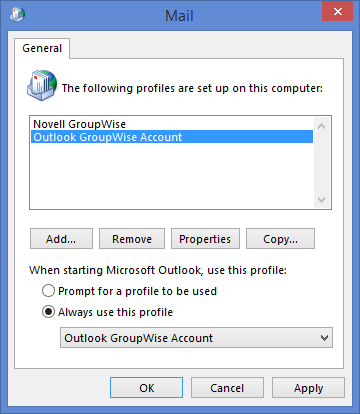 Specify a name for the profile (for example, Outlook GroupWise Account), then click OK to display the Add Account dialog box. 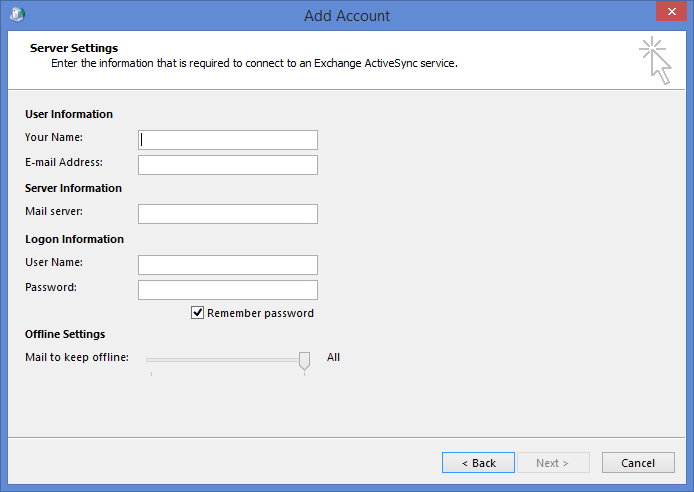 Select Outlook.com or Exchange ActiveSync compatible service, then click Next. Provide the following information, then click Next. Your Name: The GroupWise user’s full name (for example, Sarah McBride). E-mail Address: The user’s GroupWise address (for example, smcbride@acme.com). Mail Server: The GroupWise Mobility Server name or IP address (for example, gms.acme.com). User Name: The user’s LDAP user name or GroupWise user name, depending on whether LDAP or GroupWise is being used for the authentication source. Password: The password associated with the user name. When the account settings have been verified, click Close to dismiss the verification dialog box. Click Finish to return to the Mail profiles dialog box. Select one of the following options, then click OK to save your changes. 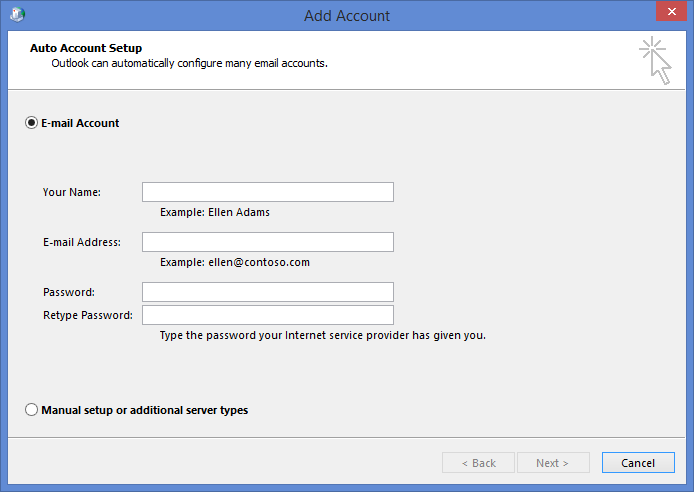 Prompt for a profile to be used: Select this option if the Outlook client will be used to access multiple email accounts and the user wants to be prompted to select an account when starting the client. Always use this profile: Select this option if the user wants to always open the GroupWise account when starting the client, then select the Outlook GroupWise account in the list. The client begins synchronizing data from the GroupWise account. There are two ways that you can configure address lookups in Outlook: the GroupWise System Address Book or LDAP. Create an Admin App in GroupWise. For the Server Name, specify the DNS name or IP address of your GroupWise server. The password is the password of the Admin App. In More Settings > Search, specify the custom base as o=GroupWise_system_name, replacing GroupWise_system_name with the name of your GroupWise system. After saving, exit and restart Outlook for the address book to be available. From the main Microsoft Outlook window, click File > Account Settings. Click the Address Books tab, then click New. Enter the server name (for example, ldap.myidomain.com). Enter additional settings as required by your configuration (port, SSL, credentials). The LDAP address book will be available for name search/selection from the Address Book list in Outlook. Microsoft Outlook has not implemented the ActiveSync 14.x ability to look up contact availability (Free/Busy information). However, GroupWise provides a Calendar Publishing Host that you can use to make Free/Busy information available in the Outlook client. For information, see Setting Up the GroupWise Calendar Publishing Host in the GroupWise 2014 R2 Installation Guide. From the main Microsoft Outlook window, click File > Options. In the left panel, click Calendar. In the Calendar Options section, click the Free/Busy Options button. Select the Publish at Location box, change the value in the box to 36 months or less, then uncheck the Publish at Location box. You can find your IFB in the GroupWise client, under Tools > Options > Calendar > Busy Search. When you go to Scheduling in the Outlook client and add a GroupWise user to the Attendees list, the user’s Free/Busy information is displayed.